Police Chief Frank Straub addresses the media Monday. Following a deadly bomb attack at the Boston Marathon, Spokane Police Chief Frank Straub says the department will increase its patrol presence in busy, public areas until more is known about the nature of the incident. "People in Spokane will notice today, and for days going forward, that there will be increased presence around shopping malls and other areas where the public tends to gather," Straub says. Spokane police officials will closely monitor the Boston investigation, he says, and take any broader security threats into account when preparing for upcoming local events such as Bloomsday or the Lilac Festival. Straub would not discuss specifics of any security measures planned for the events. "We are certainly cognizant of the large events that are coming up," he says, adding, "As more details come in about the Boston incident, we will certainly adjust our staffing levels … according to the information developed." The chief asks citizens report any suspicious packages or items, repeating the popular "See something, say something" slogan. He pointed to the thwarted MLK parade bombing in 2011 and the failed Times Square bombing in 2010 as important examples of civilian vigilance. Citing his time with the NYPD and Department of Justice, Straub says he has several years of experience in counterterrorism preparation and response. He also oversaw security for the Super Bowl in Indianapolis. Straub has received initial briefings from the federal terrorism task force for the region, he says, noting local agencies will work together to share information. He says he is aware of regional terrorism concerns, but stresses he has no information indicating any specific threats to the area. 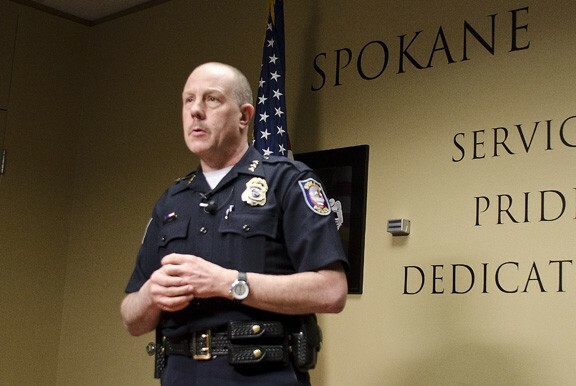 "There is no threat that suggests people in Spokane be concerned," he says, "but I believe as chief of police it is my responsibility to ensure the safety of our citizens."